Editor's Foreword. List of Contributors. Part I. General Principles of Virus Architecture. 1. General principles of virus architecture (M.V. Nermut). Part II. Methods for the Study of Virus Structure. 2A. Electron microscopy: methods for 'structural analysis' of the virion (M.V. Nermut, D.J. Hockley and H. Gelderblom). 2B. Electron microscopy: methods for study of virus/cell interactions (M.V. Nermut, D.J. Hockley and H. Gelderblom). 2C. Electron microscopy: image processing and quantitative electron microscopy (A.C. Steven). 3. X-ray diffraction from viruses (J.T. Finch). 4. Neutron scattering (B. Jacrot). Part III. Taxonomy of Animal Viruses. 5. 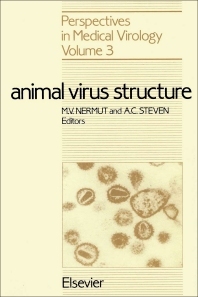 Taxonomy of animal viruses (F.A. Murphy). Part IV. RNA-Containing Virus Families. 6. Picornaviridae (P. Minor). 7. Caliciviridae (M.J. Carter and C.R. Madeley). 8. Birnaviridae (D.C. Kelly). 9. Reoviridae (P. Metcalf). 10. Bunyaviridae (R.F. Pettersson and C.-H. von Bonsdorff). 11. Togaviridae (C.-H. von Bonsdorff and K. Simons). 12. Coronaviridae (M.R. Macnaughton and H.A. Davies). 13. Arenaviridae (P.R. Young). 14. Rhabdoviridae (J.C. Brown and W.W. Newcomb). 15. Orthomyxoviridae (J.S. Oxford and D.J. Hockley). 16. Paramyxoviridae (A. Scheid). 17A. Retroviridae (H. Frank). 17B(i). Oncovirinae: type B oncovirus (N.H. Sarkar). 17B(ii). Oncovirinae: type C oncovirus (H. Frank). 17B(iii). Oncovirinae: type D oncovirus (H. Gelderblom). 17C. Lentivirinae (H. Frank). 17D. Spumavirinae (H. Gelderblom and H. Frank). 18. The filoviridae (D.S. Ellis). Part V. DNA-Containing Virus Families. 19. Parvoviridae (B.J. Carter and P.J. Tattersall). 20. Papovaviridae (T.S. Baker and I. Rayment). 21. Baculoviridae (D.C. Kelly). 22. Hepadnaviridae (L.M. Stannard). 23. Adenoviridae (M.V. Nermut). 24. Herpesviridae (J. Hay et al.). 25. Iridoviridae (F. Darcy and G. Devauchelle). 26. Poxviridae (G. Müller and J.D. Williamson). Subject index. Animal Virus Structure provides a comprehensive, state-of-the-art summary of the structure, molecular composition, and principal antigenic and biological properties of each currently recognized family of animal viruses. Information deriving from electron microscopy, computer image processing and X-ray diffraction is integrated systematically with biochemical data into three-dimensional molecular models of viral architecture. A brief account of virus/cell interaction and pathogenicity completes each chapter.